Let's return back to our two friends Jim and Ted from Part 2. Jim gave Ted $10,000 to both help a friend and hopefully make some money at the same time. Jim is in his early 60’s and ready to retire so he needs to know what to do with the rest of his money. He knows for sure that he wants nothing to do with either stocks or real estate after the recent crashes. Not wanting to take any risks, he decides to put his $1,000,000 retirement savings into the safety of a bond fund. He wants as much yield as possible, but he does not want anything too risky, so he invests in a fund that returns about 2.5% per year. This is a mixture of local government, federal government, mortgage, and corporate bonds. Most of the bonds within the fund are longer dated – meaning they are 20 – 30 year bonds which allow him to get the highest possible return. What would happen if interest rates for these longer dated bonds were to rise to just 5%? The value of his retirement fund would be cut in half, from $1,000,000 to just $500,000. Bonds underlying value are based on interest rates. Imagine there are 10 people living on an island thinking about investing in the only 2 boat making companies. They are looking for the best return on their money. The first company sells the first $1,000,000 debt offering to Michael at 2.5% interest. That means Michael collects $25,000 per year. The second boat company announced a $1,000,000 bond offering at a 5% interest rate. The next investor, Robert, now steps up and gives the company $1,000,000 in exchange for a return of $50,000 per year. This 5% rate is now the market rate for boat company bonds on the island. Here is the important part: If one of the remaining 8 members of the island wants to receive the $25,000 (the same annual return as Michael) how much would they need to buy in boat bonds? This is exactly the same situation that Jim has now put himself in. However, what if interest rates instead move from 2.5% to just 1.25%? The exact opposite happens – his investment doubles in value. This is what investors believe will occur that are purchasing bonds today. 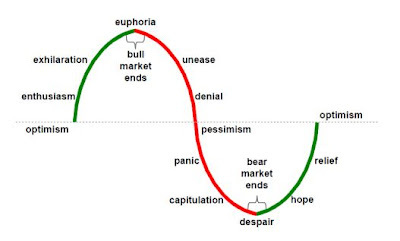 It is the exact same psychology seen during the 1999 – 2000 years of the stock market mania and the 2005 – 2006 years of the real estate mania. Investors have no care about the prices paid for the investment because they know they will always be able to sell it at a higher price. We are now about to extrapolate this concept out much further to show how the bursting of the global bond bubble will impact every part of the world around us. Before we did that it was important to explain what a bond was and how we reached the mania stage of this debt cycle. 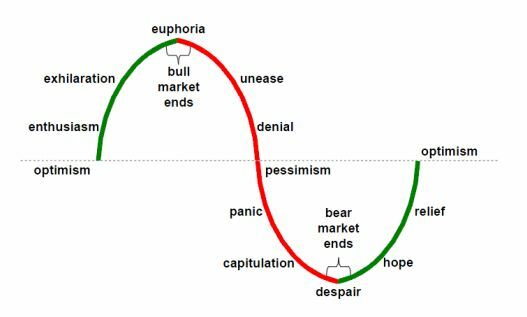 A mania occurs through the fear of loss, followed by the herd mentality creating the desire for gain, compounded by the emphasis on recency, global demographics, and the limited value of financial understanding the average investor has around the world. This discussion goes well beyond why the average investor will be hurt. Corporations have now created models moving out into the future based on a low interest environment forever. Professionals that manage money have done the same. Most now consider toxic government debt as “cash good” collateral just as they did with subprime mortgages back in 2006. When interest rates rise it will not only completely change this paradigm, it will most likely lead to a completely new financial system and potentially the next global war.